This year, the American Society of Clinical Oncology (ASCO) annual meeting took place in Chicago, IL from June 2-6, 2017. ASCO states on its website that this meeting “brings together more than 30,000 oncology professionals from around the world to discuss state-of-the-art treatment modalities, new therapies, and ongoing controversies in the field”. For the first time, the ASCO annual meeting had a global health track, meaning that they facilitated talks dedicated to global health issues. This focus aligns very much with the global health initiatives of GCI. The GCI team sent several representatives to Chicago to present on a couple of our main initiatives: patient navigation and tumor boards. 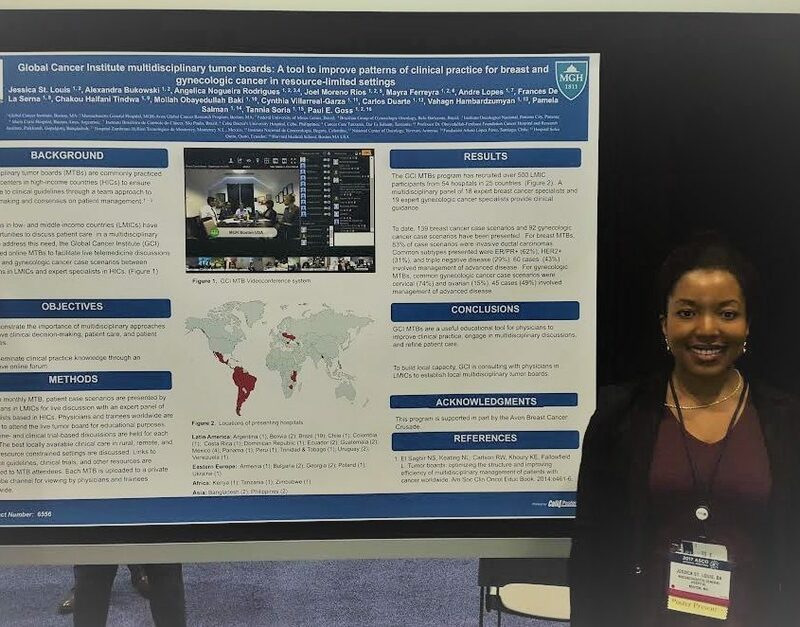 Dr. Yanin Chavarri-Guerra presented a poster on her progress at the Mexico City PN program. Titled “A Patient Navigation Program to enhance access to care for underserved patients with a suspicion or diagnosis of cancer in Mexico City”, her presentation gave a general background of the project followed by her methodology and the results of the study, concluding that PN indeed provides a potential solution to the many barriers and obstacles surrounding access to healthcare in Mexico City. You can view her abstract here. Senior program coordinator Jessica St. Louis presented a poster on the GCI tumor boards. These tumor boards have the intention of connecting doctors in an informal but effective way, working as a learning and networking venue for physicians nationally and internationally. The abstract for her poster “Global Cancer Institute multidisciplinary tumor boards as a tool to improve patterns of clinical practice for breast and gynecologic cancer in resource-limited settings” can be found here. GCI tumor boards are flexible and easily accessible to doctors all over the globe, and the GCI team is looking to expand their influence. At ASCO this year, the GCI team had a meeting with several colleagues in order to discuss launching a Spanish language tumor board. Currently, all tumor board meetings are conducted in English, but hosting a series of meetings in Spanish will widen the scope and influence that GCI has on underserved cancer patients in unilingual communities. The team is in the process of planning the pilot Latin American tumor board at the moment, led by GCI fellows Joel Moreno of Panama and Cecilia Espalter of Uruguay. They will be assisted by Yanin Chavarri-Guerra in Mexico City, Enrique Soto in Mexico City, Diego Touya in Montevideo, Uruguay, Abraham Hernandez in Medellin, Colombia, and Angelica Nogueira-Rodrigues in Belo Horizonte, Brazil. The team hopes to begin the program on July 24 – stay updated via our website!